In my commentary on The Incredibles, I made mention of a “Golden Age” of Pixar. The period I am referring to there is 1995-2010. During this time, nearly every Pixar movie made (minus Cars) ranged from above-average to artistic work of animated perfection (Wall-E is on my top ten films ever made list). Sadly with the release of films like Cars 2 (seriously Lasseter, please let this series die) and Brave, the “Golden Age” of Pixar is over. Whether it is merely taking a short break or gone forever is yet to be determined. But let’s talk about Brave for a moment. Brave is the first non-Cars Pixar film that I have not fully enjoyed. As a huge fan of Celtic folklore, I was originally ecstatic to hear that Pixar was creating a film called The Bear and the Bow (Brave‘s working title). If I had to name my largest problem with Brave, it would be its sloppy application of its feminist message. I am not against a feminist film, really we need more of them. I believe the film medium is a great platform to intelligently convey ideas and perspective. Brave is not intelligent. 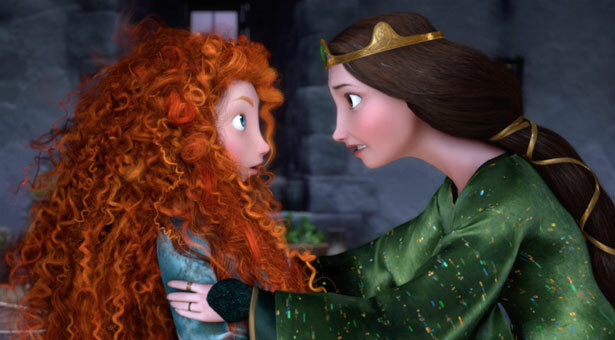 Brave teaches us that teenage daughters know more than their mothers about life and that hundreds of years of culture can be disregarded without serious consequence. This could have been an image of profound empowerment where mother and daughter realize they both knew how to live in an unfair world. Instead it’s another moment of Merida showing up her mother. So basic plot rundown for anyone unfamiliar with Brave. The film follows the story of Merida, a young girl being forced into marriage by her parents. 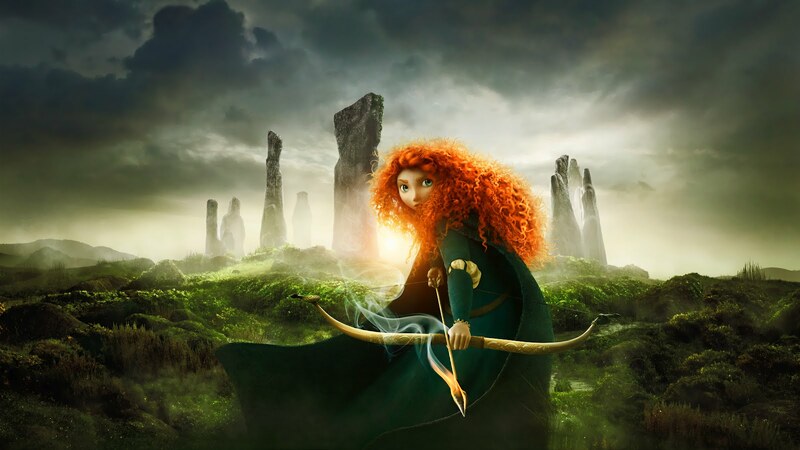 Merida doesn’t want to get married and refuses, she flees her home and encounters a witch. Desperate to escape her fate, Merida buys a spell from a witch and uses it on her mother (cause it’s all her mother’s fault and not just the societal reality of the situation). This spell unexpectedly turns her mother into a bear and, for the rest of the movie, Merida proves how stupid everyone is and then doesn’t get married. I’m simplifying that last part but that really is pretty much it. There’s a reaction scene in particular that irks me. When Merida first turns her mother into a bear. Merida scolds her, saying something along the lines of “well this is what you get for trying to force me to get married”. I have no problem with Merida saying this. She’s a teenager: selfish, proud… stupid. My problem is that the movie supports it. Not once is there ever an interjection on Merida’s immature approach to the situation. Marriage back in those days, particularly among royalty, was not done out of love. Marriage was a political move to make sure people didn’t kill each other. This was the reality for royal men and women. “Merida, please listen. It’s the Dar Ages, we will go to war if you don’t do this. Haven’t you seen Game of Thrones? True, Brave does make a side-mention that Merida’s suitors aren’t really interested in getting married either but again, you don’t change culture with a lectures from teenagers, especially not during the Medieval period! The problem really lies with centering the conflict on mother-daughter. Queen Elinor (Merida’s mother) has no real power in the situation. Blaming her for a system that already existed is believable on a character level but foolish on a plot level. Really if she wanted to actually change the culture, Merida’s main conflict should have been with her father, King Fergus since, you know, he is the only one at the time with power. But Colin, it’s just a family film, you should cut it a break. Walt Disney’s unveiled plans to “redesign” Merida. This is why movies like Brave have a point. Walt Disney has long been known for their line of princesses (most of whom do not take an active role in feminist culture) and Merida is now going to be included. That should be a good thing. Regardless of my feelings on the movie, including the princess who didn’t get married is good. It gives girls a new role model and teaches them that there is more to pursue in life than a ring. So yay Brave for that reason. However, this “redesign” is not good… at all. 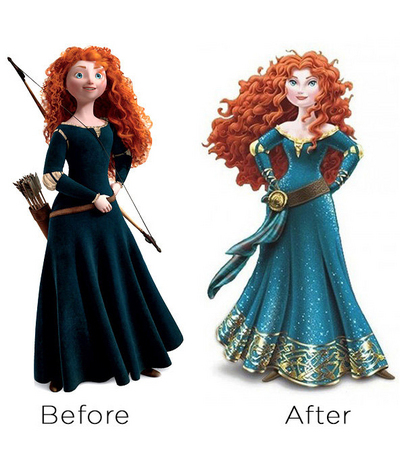 It takes hotheaded, imperfect Merida and transforms her into a skinnier, doe-eyed fairy princess. So much for an intelligent conversation on feminism. Neither side here is right. We have the movie with its immature approach and now the Walt Disney corporation has reacted with their own immaturity (they are refusing to change the new image, despite objections from both the filmmakers and some consumers). Why make Merida look like that? Why take the fire out of this princess? She has been subjugated in this new design and no amount of impassioned lectures (yes I see the irony of this post) is going to change that. It is sad that, in the 21st century, in a so-called age of progress, we’re still having stupid arguments. Having a stupid argument about a stupid subject is one thing but feminism deserves better than this. It is intelligent so can we please be mature about it? No more movies that strip it down to bare, idiotic ideals. No more redesigns that show us how important those ideals are in the first place. We need a better princess for feminism, good thing one exists – Mulan. Note: if anyone out there feels that because Mulan has a romantic interest she cannot be a good role model for feminism, please tell me so. We’ll have a fun conversation about it. Merida could learn a thing or two about being strong. 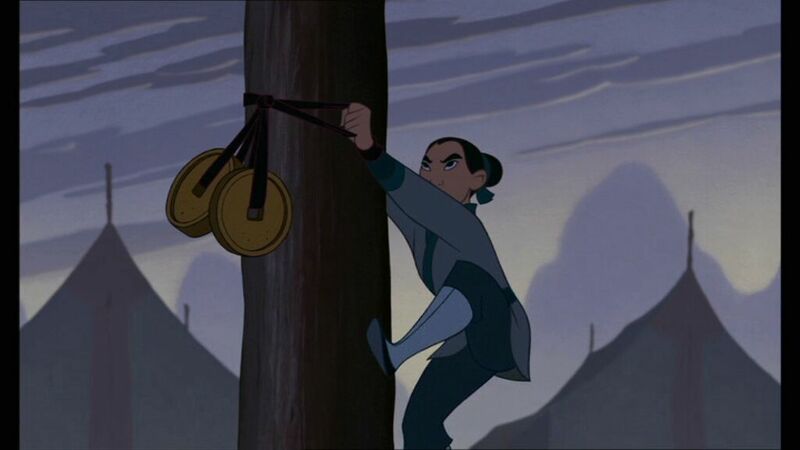 I do think Mulan is the best example on feminism. But my thing about Brave wasn’t that it was unrealistic, but because it had a weak plot. I was hoping for a Pixar Mulan. And it just wasn’t that exciting. There are some parts I like though.